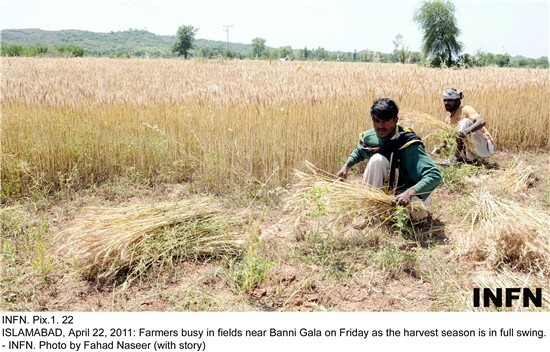 Farmers in the rain-fed areas of Islamabad and Rawalpindi division are in a rush to harvest Rabi wheat crop before new rain spell that is starting from 27th April. Metrological department forecast more rains next week. “This week’s heavy rains delayed harvest and we have to wait for a few days so that standing crop of wheat dries up. Now we are harvesting it quickly before any damage might befall our crop,” said Fazal Elahi, 40, hailing from Banni Gala told INFN. The country this year expects good wheat crop with a target of 24 million tonnes. In year 2010, due to fewer rains, the farmers in the barani (rain-fed) areas could not get good wheat yield. Experts say though last year’s floods caused devastation, they also had a promise of good crop ahead for the farmers. Besides the international community through Food & Agriculture Organization (FAO) provided quality seeds of wheat worth US $ 54 million to the flood hit farmers in hope of a bumper crop to feed half a million poor rural population for next six months. “Once the harvest is completed, this donation will have produced a crop worth almost $190 million in wheat flour, the main staple, at current local retail prices,” said FAO statement. Farmers in barani areas say since they could not start timely harvest due to rains, almost all the wheat fields are now ready to be harvested as they are facing shortage of human resources to cope with this situation. “We have hired labourers at high wages as compared to last year to help us harvest the crop quickly so that we can thresh it out well before new rain spell. Moreover we bought fertilizers at high costs and hence this year, cost of production is too high,” said Noor Azam, 45, a farmer from Fateh Jang Road. Talking about the forthcoming problems faced by the wheat farmers in barani areas, Nasir Aziz, Actionaid’s programme officer on food and agriculture said it is crucial time for the farmers to harvest before any damage is caused. On the International Day of Peasant Struggles, prominent farmers, pastoralists, fisherfolk, human rights and research organisations have sharply criticised the World Bank, three UN agencies and governments for promoting agricultural investments that are resulting in land grabbing on a massive scale. From 18-20 April, investors, government officials and staff of international agencies gathered in Washington DC for the Annual World Bank Conference on Land and Poverty to discuss how to operationalise a framework called Principles for Responsible Agricultural Investment (RAI). Formulated by the World Bank, International Fund for Agricultural Development (IFAD), UN Conference on Trade and Development (UNCTAD) and Food and Agriculture Organisation (FAO), RAI consists of seven principles, which investors may choose whether or not to abide by when conducting large-scale farmland acquisitions. A statement released by Centro de Estudios para el Cambio en el Campo Mexicano, FIAN International, Focus on the Global South, Friends of the Earth International, Global Campaign on Agrarian Reform, GRAIN, La Via Campesina, Land Research Action Network, Rede Social de Justiça e Direitos Humanos and World Forum of Fisher Peoples calls instead for an outright ban on land grabbing. Accounts pouring in from Asia, Africa and Latin America reveal that local communities are being dispossessed as never before of their sole sources of food and livelihood security. Reports indicate that at least 50 million hectares of good agricultural land – enough to feed 50 million families in India – have been transferred from farmers to corporations in the last few years alone. Investment brokers estimate that US$25 billion have already been committed globally, and boast that this figure will triple in a very near future. RAI will offer such large-scale land deals a cloak of respectability. “The new wave of land grabbing will have a devastating effect in the Amazon and Cerrado by giving the green light for illegal activities of large cattle ranchers, agribusinesses, mining and lumber companies to destroy protected forests and biodiversity in food production by small farmers and indigenous land,” said Maria Luisa Mendonça, Network for Social Justice and Human Rights, Brazil. The United Nations Food and Agriculture Organisation (FAO) is seeking to boost cooperation and dialogue with the world’s indigenous populations in the fight against hunger. The new ‘FAO Policy on Indigenous and Tribal Peoples’ aims to ensure that indigenous people are given more consideration in all relevant aspects of the agency’s work. The policy is designed to foster better exchange of knowledge and ideas between indigenous populations and the Rome-based organisation. It gives guidance to the agency’s headquarters and regional staff, urging more systematic and responsible engagement with indigenous peoples. Issues such as land tenure, sustainable resource management and the preservation of traditional knowledge and food systems are of particular importance. Indigenous populations possess specialized knowledge about natural resources and diversity and often have coping strategies for the effects of climate change. FAO’s new policy notes that the erosion of traditional skills possessed by indigenous people works against efforts to achieve food security and sustainable development. With indigenous and tribal peoples comprising around five per cent of the world's population but about 15 per cent of the world’s poorest people, they are particularly at risk of a failure to address the problems. A number of UN agencies worked together closely with indigenous representatives to formulate the new policy, which is based on international legal instruments such as the UN Declaration on the Rights of Indigenous Peoples, adopted in 2007.